You have pieced and sewn together your blocks, cut out your batting and your backing and now you are ready to quilt. Before you start sewing designs through your quilt top and layers, consider coming up with a plan for your quilt design. Learn what to look for and what design will work best for your quilt top and pick the best design to create the perfect quilt. Find out how to make your quilt look its best with different quilting methods. Consider your quilt top. Before settling on a quilt design pattern, figure out the meaning and purpose of the quilt. A decorative wall quilt will be used as heavily as a quilt to cover a bed. A decorative or elaborate pattern might work well for minimally used quilts, while a basic diamond or scalloped pattern works to keep all the layers and fibers in place of an often-used quilt. Think about your quilting style. Figure out if you prefer to hand or machine quilt your quilt top. Sewing the quilt layers through a machine may be difficult if the batting is thick or the fabric has a coarse weave. 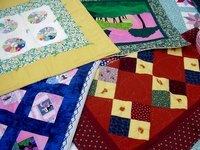 Hand quilting makes small or elaborate designs easier to execute. Decide on a pattern. Basic quilting patterns include cross-hatch, stipple and echo variations among many other types of quilting patterns. A cross-hatch pattern has closely parallel lines that crisscross over the entire quilt layers. A stipple effect is a loose, squiggly line that flows over a contained area like a quilt block or border. Echo quilting involves sewing around the perimeter of a shape to secure individual pieces into place. Choose a pattern that works for the large areas of the quick, and save smaller, more complex designs to accentuate specific features of your quilt top. Test your design. Trace your design onto tracing paper and lay it over sections of the quilt top to give yourself an idea of what the quilt pattern will look like. Trace several designs to give yourself a few options before sewing. Mark your design with a fabric marker or pencil on the fabric before you begin quilting.